This is a Flickr badge showing items in a set called Crafts. Make your own badge here. Look what's (sort of) new in our house! Well, actually, it's not new at all...it's just sort of new to us. And actually, we've had it for over a year, but it looks new. Well...oh, let me just start over! 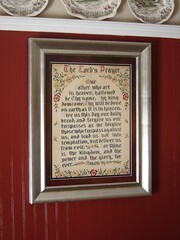 This needlepoint Lord's Prayer was stitched by Brian's maternal grandmother at least 60 years ago. Brian's mom remembers it in her childhood home. We received it about a year ago, but it was in a different frame, and the glass was broken. It had been framed simply years ago, and the colors and material were deteriorating. Brian's parents offered to pay for us to have it reframed, and here is the beautiful result. 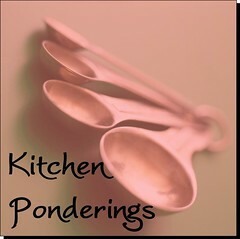 I chose a pewter-toned frame because we have pewter accents elsewhere in our dining room. We're so happy to have this special family heirloom protected and prominently displayed. It brings back special memories of family time with Grandma Swanner. Thank you, Linda & Bobby! Mrs. to my heaven-sent Mr. *** Maker of miscellaneous creative stuff. *** Mommy to our precious son. *** Mended by Jesus Christ, who loves me and changed me.